My Bargain Basket: FREE 2ct. Sample of Cascade ActionPacs! 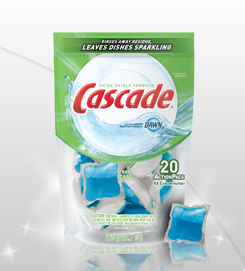 Snag a FREE 2 pack sample of Cascade ActionPacs! Grab the following three Cascade coupons while you are there. This is a P&G Solutions freebie and you can only have one request per quarter. If you’ve already requested a free sample between Jan. 1 and March 31, you wont’ be able to request another another sample until June 30th.